I told this person that the supposed quote was fake. 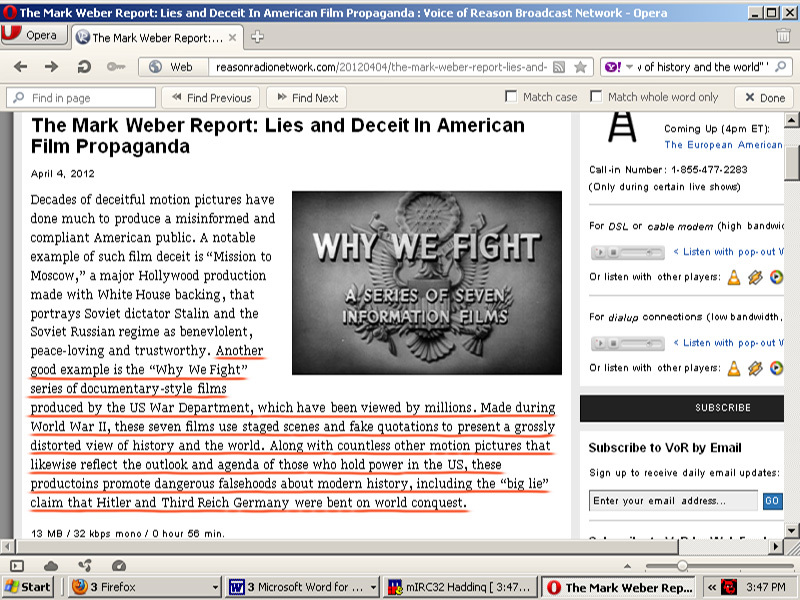 I was practically certain of it because of my research during the past few years of fake Hitler quotes, especially some appearing in the U.S. Army's propaganda series Why We Fight. I knew what kinds of statements Allied propaganda falsely attributed to Hitler, and this looked typical. My interlocutor did some searching and reluctantly admitted that I was correct, that this was a fake quote. He indicated an article by Mark Weber, "Fraudulent Nazi Quotations," as the factor that had convinced him. 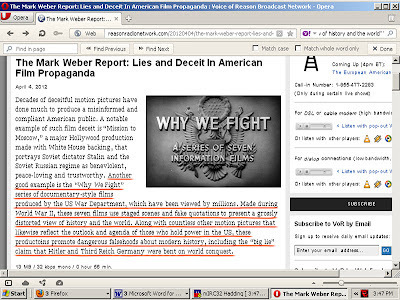 When I read Weber's article, I found something very interesting: Weber was using information that he had gotten from me. This may seem like a small matter, but let me give some context. Recently I had an editor of a well known revisionist website (not IHR) contact me asking permission to use some of my work on fake Hitler quotes. He thought the work was very good and he wanted to quote it extensively. He was willing to give credit to Hadding Scott as the researcher, but he was averse to letting the world know that he had read a national-socialist blog. Therefore he was not willing to post a link to National-Socialist Worldview. I said, posting a link is the minimal courtesy, but if you want permission to use my work without that minimal courtesy, then send me a donation. This man was unwilling either to link to my blog or to give a donation. So, permission was denied, and so far as I know my work is not being used on that website. Now, what Weber has done is just take a couple of nibbles from my work. But stealing only a little bit is still stealing. How long do you think a store could stay in business if it became known that they would not prosecute shoplifters that stole in small increments? I just happened to notice Weber leaving the store with the candy spilling out of his pockets and I said, Sir, you need to pay for that. Payment in this instance, I stated to Weber, would mean putting a link to the fake quotes section of my blog along with the other references for "further reading" that appear beneath his article. It would cost nothing, except perhaps the terrible costs of letting the world know (1) that he was cognizant of a dreaded national-socialist blog, and (2) that he used the research of somebody that has no mainstream credentials. Weber evidently does not want to do that. He denied that he had gotten the information from my work, but offered no alternate explanation. He said that he had long been familiar with Hermann Rauschning's fraud, but that is really not an answer, since what I think Weber has stolen from me is not a finding about Rauschning per se, but a finding about the relationship of Why We Fight to Rauschning, and about a fake quote featuring a word, "terrorism," that in fact does not appear in Rauschning. I do not believe Weber's claim that he had never seen my blog, because I have a pretty clear recollection of sending links to IHR in the hope that they might use some of my work and give me credit. Even if he had not seen my blog, there are other ways that he could have seen my work. I pointed out to Weber the inadequacy of his response, and I sent him approximately the text that you see here, informing him that lacking any adequate response I would make it public, but he has had nothing further to say. In fact, with the podcast that appeared on Voice of Reason immediately after I sent my initial complaint, after Weber's response, and after I explained that the response was inadequate, Weber is practically thumbing his nose at me. Originally the title of my declaration about this matter was going to be something less direct than "Mark Weber: Plagiarist," but as things are, I see no reason to cut any slack. I really wanted to avoid open conflict in this matter, but I am far from being the first to state publicly a complaint against Mark Weber. See, for example, Professor Robert Faurisson's polemic from 2009, "Mark Weber must resign from the Institute for Historical Review." Dr. Faurisson accuses Weber, among other faults, of "faint-heartedness": Weber has tried to be less controversial at the expense of truth and accuracy; he has been unnecessarily equivocal; he has even backed away from forthright refutation of the Holocaust-lie. That faint-heartedness, as Professor Faurisson calls it, would also explain why Weber does not wish to give recognition to National-Socialist Worldview or its author, even though it is clear that he has derived some facts and ideas from here. Update: On the same day that this complaint was posted, Weber removed "Fraudulent Nazi Quotations" from IHR's website. It still appears on various blogs and fora where it was reposted. Second Update: By the evening of 17 April 2012 the article has reappeared.